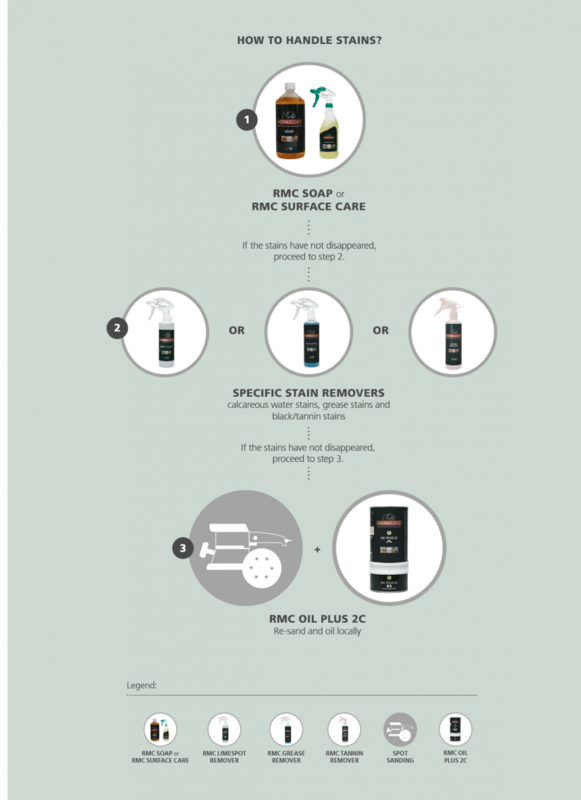 Although many stains can be removed with RMC Soap and RMC Surface Care, Rubio Monocoat also developed a number of specific stain removers. Stubborn lime stains can be handled effectively with RMC Limespot Remover, grease stains with RMC Grease Remover and black/tannin stains with RMC Tannin Remover. If the stain has penetrated the wood too deeply, the spot can be sanded and re-oiled. First select the most suitable spot remover for your spots. Does your wood need to get completely freshened up? Follow the complete step-by-step plan here.